Because as nice a film as Breakfast at Tiffany's is, I don't know how much of a thread we can generate -- and this board could obsess for weeks over Audrey. OK, BAT -- you probably know that Capote wrote the original novella, hated how it was adapted, how it was blunted for the movie. You can probably guess what later TV role Buddy Epsen used this movie to finagle. Henry Mancini's score rules the earth. But Audrey is at her peak of beauty, as the way she made herself up in the early 60's was simply jawdropping. And her moving from jaded socialite to naive child to flighty friend is a natural, encompassing all of the contradictions implicit in such a mix. 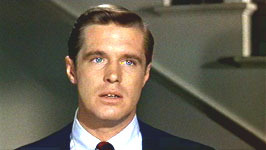 And it was the one really good role for George Peppard, and a whole generation who only knew him as the guy from the A Team always gets shocked to see him in this role. Micky Rooney, though, at his worst. Cringe-worthy to the max. Works for me. Where to next, Roman Holiday? Audrey is yes, adorable. But naturally I do identify with Peppard's character quite a bit, but I suppose every guy does. We all have THOSE girls in our lives, right? Holly is written as the worst case scenario, this delusional purehearted gem of a woman. She's Elvis Costello's "Party Girl." Just as much as Rooney plays the offensive stereotype, in a way, Hepburn does also. Well, you see, that is a great illustration of one reason I am not so wild about a lot of modern flicks -- the only word I can think of is class, or maybe elegance. Audrey is always so elegant -- I could never see her playing a role where she threw up on a date. That sort of class is in short supply today, and while not every film needs it, we need it in our movie diet on a regular basis. We need people like Audrey and Cary G in our lives, dangit! You guys should really see Two For The Road. That's by far the best thing she ever did. That's on my list for sure. It just never is at the library when I look for it. Although my fav Audrey is a tie between Charade and Wait Until Dark. It's real, real cheap to buy and you'll want it for your library, trust me. I agree with you on Charade Jeff. A very funny movie with terrific dialogue. i'm a huge fan of the big movies of course, but "the children's hour" and "green mansions" i REALLY love. "two for the road" is fantastic as well. tbh, i think one of the weakest ones is "breakfast at tiffany's", for many reasons. the opening credits to "charade" are cool beyond belief. my last tattoo was almost a tattoo of audrey. every december i get a new audrey calendar. i'm totally obsessed with her.